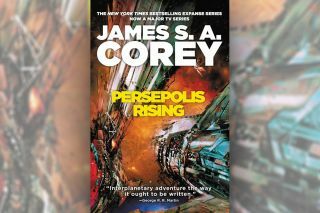 "Persepolis Rising," the seventh book in the "Expanse" series from James S.A. Corey. The latest installment in James S.A. Corey's "Expanse" series is the beginning of the end for James Holden's crew, setting a course for the final books of the series. "Persepolis Rising" leans hard into that development by jumping ahead three decades after the previous novel's events, the first time the series has made such a drastic time-jump. An older Holden and his crew begin the novel working for the Transit Union that now oversees trade among the many worlds accessible through a system of alien ring gates. But a human state with otherworldly technology emerges to upset the three decades of relative equilibrium. The premise allows familiar characters to fall back into their earlier roles as they try to defend against the new human threat, but with the added weight of three decades shading their actions and interactions with one another. Watching the Rocinante crew scramble and react is a satisfying part of the new story, as is the slow but continuous drip of hints surrounding the alien protomolecule technology and the forces that might have arrayed against it in the distant past. Without giving much away, the time skip sets a clear gap between the previous six novels and this one, and this book's ending is a clear act-one finale for the series. Some aspects of the book's main plot are resolved, but enough lines are dangling that you wonder what's about to spring out and grab hold of them.